Saltwater fishing knives are ideal for tasks such as chopping bait, cutting the fishing line, cutting rope, etc. These knives have great utility but can also be perfect for cutting and processing fish. Many of them are versatile, compact and considered an all-purpose item. One of the main advantages offered by these knives is that they are easy to carry around because they have flexible blades and handles. Some you can fold to a compact size and tuck them away safely. Saltwater fishing knives are specially designed to withstand the rigors of salty air and water. They are highly corrosion resistant and super strong to handle large fishes. With that in mind, purchasing a high-quality knife for saltwater fishing is crucial to ensuring optimal performance. NOTE: This article reviews the best saltwater fishing knives on the market and focuses more on their utility when out angling. If you are looking specifically for a filet style knife, we suggest checking out this article: The Best Fillet Knife for Saltwater Fish. There are a few considerations every angler should consider before choosing a saltwater fishing knife. In this section, we take a closer look at each of these factors. Generally, fixed knives are best suited to hard tasks while folding knives are ideal for light-duty applications. Fixed blades are more durable and don’t break easily. On the other hand, folding blades have more points of weakness and are more susceptible to corrosion. The size of the blade is always a significant factor to consider, regardless of the intended purpose. And while bigger is always better, a blade that’s too long may compromise your ability to complete finer tasks efficiently. On the other hand, a short blade doesn’t perform well when it comes to rugged applications like chopping or batoning. We recommend choosing a knife that’s at least 3” long and at most 10” long. Full Tang refers to knives whose blade and handle are made from a single piece of metal. Full tang blades are more robust than push tang, half tang, and rat-tail tangs. This is because partial tang blades tend to loosen with continued exposure to demanding tasks. Full tang knives are usually wrapped with cordage, wood, hardened plastic or other material to ensure a comfortable grip. Stainless steel is the best material choice because it is leaps ahead of other materials regarding durability and corrosion resistance. Titanium is also a good choice as it is super durable and resistant to rusting. While lightweight and strong, aluminum doesn't stand up well to prolonged moisture exposure. A good, solid grip is an essential factor to consider when shopping for a saltwater fishing knife. The last thing you need is a knife that keeps sliding through your fingers every time you try to cut. This is not only inefficient but also increases the risk of accidental cuts. Most companies have a reputation for patented handle designs that ensure comfort, efficiency, and optimal safety. Look for handles with grooves or rubber coating. Spyderco knives are very sharp and known for their clothing clip on the back and an opening hole on the spine. The Atlantic Salt series of knives are made from H1 steel, which has a high rust resistance. It is commercial steel with less than 1% carbon and high Chromium, hence impervious to corrosion. 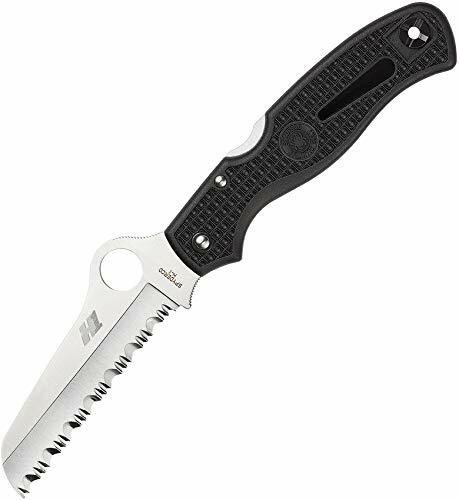 This particular model comes with a hollow ground sheep foot blade with SpyderEdge serrations and a 14mm opening hole. It offers excellent cutting performance for a long time in and out of salty ocean water. The rounded tip helps to prevent cuts in case the knife drops accidentally. The Spyderco comes with a molded FRN handle designed to provide ultimate comfort. It includes a shackle key and a reversible titanium pocket clip. You can carry your knife either on the left or right side for easy access. The lanyard hole allows for backup retention when used with a lanyard cord. As such, you don’t have to worry about the inability to retrieve your knife when it falls in the water. Also included is a high strength back lock mechanism that ensures secure blade lock up. This utility knife has a 3.6 inch fixed blade made from hardened steel. It is designed to withstand harsher uses and stay sharp for a long time. The Sandvik stainless steel blade is ideal for marine and outdoor applications where there is continued exposure to moisture and dirt. It has an ergonomic handle forged from TPE rubber and manufactured using coil-formed rounding process. The result is a firmer grip and more cutting control. It has a forward finger guard to protect you from accidental cuts. Also included is a hard plastic Combi Sheath that provides safe storage. It has a quick connect feature that can be utilized for attaching a second knife. 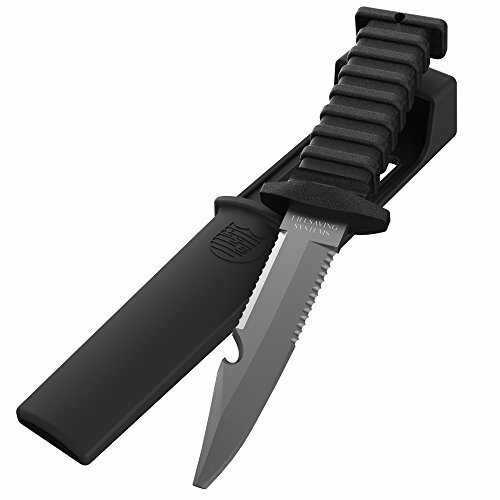 This survival knife is trusted by the US military and is the standard issued for Search & Rescue Swimmers. It boasts high-quality build with heat-treated Titanium that doesn’t rust after continued exposure to saltwater. 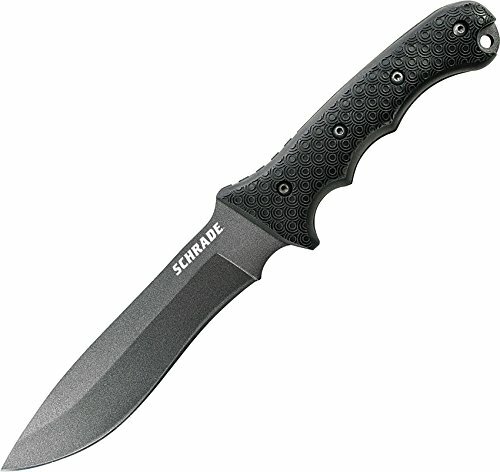 It features a 4-inch blade that is partially serrated. The line cutter comes handy when you need to cut the fishing line while the blunt tip provides added safety. The knife also features a handle made from high strength design. It has grooves that allow for a firm grip in dry or wet conditions. The durable sheath has a belt/webbing attachment and offers safe storage for your knife. 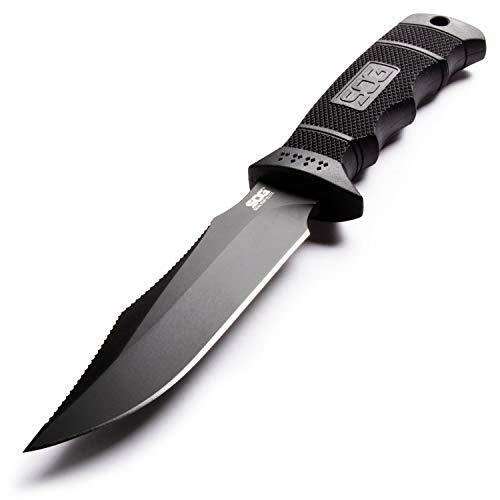 SOG is a famous brand recognized for its high-quality survival products. The Seal Pup Elite E37SN-CPis a versatile knife with an extremely sharp blade. The fixed blade is 4.85 inches long and 0.185 inches thick. It has thumb rises for increased control and a black tiny straight edge with a clip point. The blade extends to the top of the handle, giving you more cutting control and improved longevity. It is made from AUS-8 stainless steel with a Rockwell rating of 57-58. The stain and corrosion resistant coating improve tolerance to harsh salty sea air. 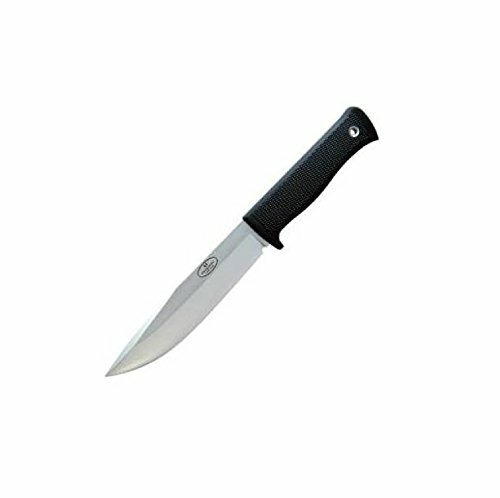 Another major selling point of this knife is the handle, which is made from fiberglass reinforced nylon. It is highly resistant to harsh acids, electricity and extreme temperatures. The lower upper thumbs prevent the blade from twisting while deeper finger grooves offer a firmer grip. There is a lanyard hole at the base of the handle that makes portability more convenient. SOG provides this knife with a few handy accessories like a belt loop extra as well as Kydex and MOLLE sheath. It has a Velcro shutter and can be worn right or left handed. Fallkniven is a popular brand established in the early 1980’s with a history of producing high-quality knives since 1987. The company makes survival and tactical knives for the Swedish Army. The Fallkniven A1 boasts a Scandinavian design that is charmingly simple with real weight to it. The knife is 11-inches long and has a 6.3-inch drop point blade. While we would prefer no swedge, the hefty swedge of this blade lends increased strength to the tip. Its convex-ground edge is prized for its superior performance, good retention, and resilience to high impact tasks. You can work and work with the knife, and never have to worry about sharpening it every few days. As for the blade material, Fallkniven decided on VG-10 steel for the core and 420J cladding. The handle has a simple design and fills your hand nicely without forcing it into one grip or another. It is made from Kraton, a semi-rubbery polymer with a high density. To ensure a firm and comfortable grip, Fallkniven incorporates beautiful diamond texturing on the handle. The lanyard tube insert at the end of the handle makes portability easier while a single forward guard offers added protection from accidental cuts. This knife is provided with a Zytel sheath that extends safe storage without adding too much weight. If working with a low budget and need a quality knife, the Schrade SCHF9 12.1” is a good contender. It is a great piece of innovation designed to withstand the test of a knife. It is very durable thanks to 1095 high carbon steel construction. It is super strong and handles the toughest tasks without losing its edge. Schrade applied a Teflon coat to make the steel extra resistant to corrosion. The medium-size knife has an overall length of 12" and a 6.4" blade. Its blunted tip is strong and less susceptible to breaking compared to pointed ones. The full flat grind is a beneficial blade characteristic that lends a tougher edge. All of the above combined with a 6mm blade thickness makes this knife perfect for almost any task. Schrade put a lot of attention into designing the handle. It is made from a hard rubber known as Kraton. It is lightly textured and offers an excellent grip even when wet. There are three finger coils on the handle and a large palm swell. These make it easier to hold the knife with and without gloves. When it comes to accessories, the SCHF9 is shipped with a Cordura sheath that has an adjustable retention strap and heavy-duty plastic insert. The eyelets and Velcro provide more mounting options. 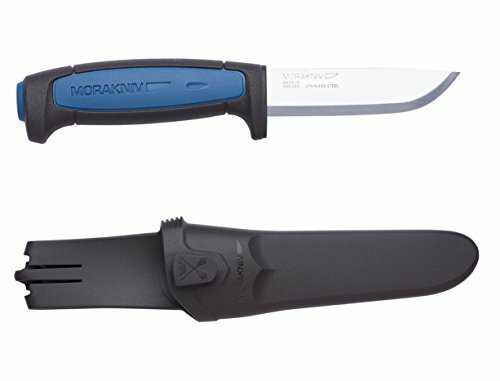 The CDS-Survival MOVA-58 is another one of our favorite saltwater fishing knives. It comes with a stainless steel blade that’s ideal for cutting, filleting, cutting the fishing line, batoning, splitting and more. Its full tang blade design makes it particularly a favorite among outdoor enthusiasts because it can withstand stronger applications and last longer than half-tang blades. The blade is 5.7” inches long and 1/8-inches thick, a perfect combination for ultimate strength. Another feature worth raving about is the Cocobolo wooden grip. It is attached with Allan head screws and facilitates a firm grip, allowing you to work more comfortably. Additionally, the handle gives the knife an aesthetic appeal while withstanding prolonged exposure to salty air. A 90-degree spine is incorporated for perfect gimping. CDS-Survival takes a unique approach when it comes to accessorizing their knives. This particular model is shipped with a sharpener stone, allowing you to sharpen your knife anytime anywhere. 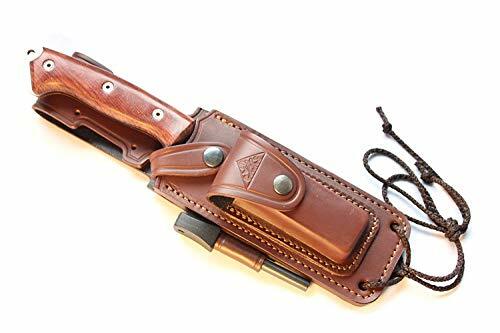 It also comes with a genuine leather sheath for safe storage and transportation. The ESEE 4P is an American-made knife designed to withstand the test of time. It cuts through almost anything thanks to its 1075 high carbon steel blade with a Rockwell hardness rating of 57. It has an overall length of 9.0 inches, with the blade being 4.5 inches long and 1.25 inches thick. The knife is an excellent tool and can also be used for processing small fish and other light-duty tasks on open waters. Being a drop point blade with a fixed and full tang design, you can rest assured that it is capable of withstanding repeated hard use. It comes with a grey handle made from two removable slabs of Micarta. It has a rounded pommel and a lanyard hole for better portability. The included coyote tan sheath offers safe storage and features an optional MOLLE attachment. It is held together with screws, which allow for easier grip adjustability compared to rivets. The knife is reasonably priced and backed by a lifetime warranty. When searching for the best knife for saltwater fishing, you need one with great utility to perform many tasks like chopping bait, removing hooks or cutting through rope. Our top 8 recommendations offer the best bang for your buck, but considering the factors discussed will help identify a model that’s ideal for your needs. As with any other product, you should keep the cost and warranty in mind when looking for a new knife. Other important factors to consider are blade size, flexibility, type of cut, full tang and fixed versus foldable blade. We leave you with this thought. “A fisherman without a knife isn’t a fisherman”.